Today my guest is Chris Graham. Chris is the President of MoreBeer and MoreFlavor Inc, one of the top online suppliers of homebrewing equipment and ingredients. Chris is also an instructor at the World renowned Seibel Brewing Institute. We start with a discussion of beginning fermenter options including the plastic bucket and also the glass carboy. We discuss additional options including the newer foodsafe plastic carboys and plastic bucket style fermenters. Chris shares some of the advantages of a conical fermenter which lets you harvest and separate yeast as well as enhances fermentation activity. We also discuss other shapes including the flat bottomed brew bucket style of fermenter. 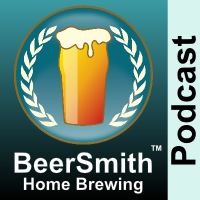 Chris talks about materials used in homebrew fermenters including glass, plastics and stainless steel and advantages of each. We discuss the new crop of high end fermenters that include conical stainless steel systems for both 5 gal (19 l) and 10 gal (38 l) batch sizes. Some new fermenters also include temperature control options – so we discuss briefly how these systems work. He explains pricing of fermenters which go all the way from a $10-15 bucket to potentially thousands of dollars for a glycol chilled stainless fermenter. I love the podcast and really enjoy how everything is straight to the point and focused on beer and not running off on tangents laced with cuss words every third word. This was a great discussion and one I’ve spent a lot of time debating on with myself on is a conical really necessary for my next 1-2 year goals. Thanks for the information, I think I’ll hold off to see what the new fermentasaurus looks like with it’s new size.